Carnival Glory was the first cruise ship to call at Saint John this year and to commemorate the occasion, a special celebration was held on board attended by local dignitaries and the ship’s officers. Carnival Glory was visiting Saint John during its inaugural cruise from Boston that departed earlier this week, part of the line’s first extended schedule from that port. 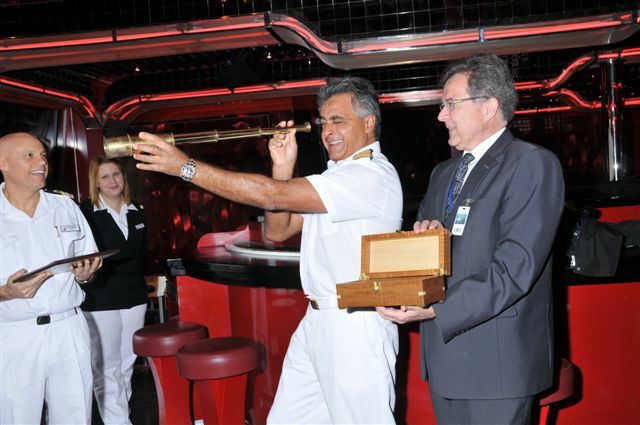 During the reception, Captain Salvatore Rassello was presented with a number of commemorative gifts, including an explorer telescope – a Saint John tradition – by Saint John Port Authority CEO Jim Quinn. The captain also provided reciprocal gifts to each of the presenters, including Saint John Deputy Mayor Shelly Reinhart. Carnival Glory’s 2012 Boston schedule kicked off last week with a special week-long cruise to Saint John, Portland, Maine; and Halifax and Sydney, Nova Scotia, which will be followed by a summer program of four- and five-day cruises to Saint John and Halifax. Carnival is the only cruise line offering short cruises from Boston and Carnival Glory will operate a similar schedule from Beantown in 2013.